Aspiring authors often hear the advice “write what you know.” If all writers closely adhered to that rule of thumb, we would certainly all be limited in scope! Just consider the historical, fantasy, paranormal and horror writers, for instance, who can’t live in the worlds they write about. Solid research can make all the difference, along with imagination when developing situations and even entire worlds beyond one’s own experiences. But for me, small towns, rural life, ranches and horses–and yes, the beauty of the Rockies or the far northern parts of the USA–are usually where I “want to be” when I sit down to write. Writing days don’t always come easy. Some days, it’s hard to feel inspired. Today, for instance, as I ponder the possibilities of finishing a writing deadline on time. Yet, if I look out my office window toward the horse barn and pasture, that in itself can be inspiring. 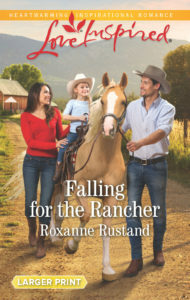 During the time I was writing my June 2017 Love Inspired novel Falling for the Rancher, for instance–which involved two veterinarians, and lots of animals. :) Did I mention the dogs at my feet as I type this post? Our daughter and son-in-law have sold their house and are staying with us while house hunting, and so we get to enjoy not only them, but also their two dogs. Added to our two dogs, our house and yard are now like a dog park! Animals have such unique personalities, don’t they? Our Elmo has evolved into a distinguished old gentleman, who loves nothing more than to sit on someone’s lap, though he’s a Border Collie and not all of him fits. :) Sage the Golden is four and still like an exuberant, rowdy immature kid. 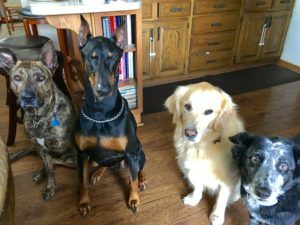 The newcomers: Ziggy the Mountain Cur is pure heart–just wanting to be loved, and Zane the Dobie is simply hilarious. Do you have pets at your house? I would love to hear about them! Best wishes for a wonderful summer!! Hi Roxanne. We no longer have pets, it was not fair to have a pet that needs lots of attention when I returned to full time work. With all of us out, the poor pet would get awfully lonely! However, we do have some Queensland Stick Insects, 2 Bearded Dragons, a couple snakes, turtles and fish in the labs at school that my kids help take care of. Technically not our pets, but the boys get to interact with them a lot. How wise of you to decide that having pets wouldn’t be fair to them with your busy schedule. We bought a horse once, whose owner rarely went the stable, so he sat in a stall week after week, where he got fed but never let out. He ultimately developed habits to deal with his anxiety: cribbing, and weaving in his stall. Poor thing. With us, he was out in the pasture and only kept inside during inclement weather. I know he was SO much happier…though he never lost those anxious habits. In one word: bacon. :) Everyone was told to sit, and they each got a tiny bite for their efforts. LOL! Hi Roxane! Thanks for sharing. We enjoy having pets. Presently we have a 15 year old deaf Sheltie named Penny. She loves the grandkids and is especially gentle with our 6 month old granddaughter. She is well trained and now that she is deaf, she obeys hand signals. Over the course of 44 years of married life, we have had a variety of pets. A canary winged bee bee parrot named Laura, who loved to read the newspaper and even let a mouse invade her cage and eat her sunflower seeds. We had a hermit crab named Herbie, that was an escape artist. Escaped his cage and hid for 2 weeks before emerging from my son’s closet. We had a tailless cat (lost tail while dodging a car) named Mimi, who played fetch. Even though an indoor cat, every summer she managed to escape and catch a bird. She shocked the bird, held it gently in her mouth, until we saw the bird. Then let it go. At first the bird was stunned, but then the birds always flew away. We had two other cats, Smokey and Abbey. Smokey, fitting name, survived our house fire and hid in the woods for 3 days until we found him. We also had another Sheltie named Lord McBeth. Too many stories to share and lots of fun memories with our pets interacting with our three sons and grandchildren. Thanks for the photos. 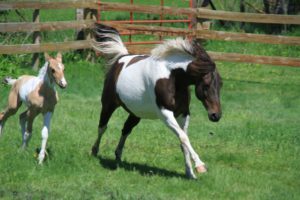 Love the joy as the horses frolick in the pasture. Nice pictures of the dogs. Best wishes. Enjoy your summer with family and furry friends. Really enjoyed hearing about your many pets, Renate! Each has its own story.,…what fun! We have a cat who thinks he is a dog. I love books that include animals! If I see an animal on the cover, I’ll at least take a look at the book. We are owned by a cat named Bookie, who makes retirement enjoyable. I had never seen one until just recently. So cute! what pretty horses and wonderful dogs. I have always had pets in our house. then we lived on a farm for a while. 20 years into marriage our dog died. I just wanted a break. and my husband was allergic to cats. so there were a few years with no animals. wow. I really did not like that. it was pet lonely. so for Christmas our two kiddos got us a 4 month old kitten. turns out he was part Russian blue and they are hypo allergenic cats. we have had him 10 years now and my husband has had no problem with him. So interesting to hear about your cat! I didn’t know that the Russian Blues are hypoallergenic. Our son-in-law is horribly allergic to cats, and our daughter really misses having one. Maybe this breed would work! We rescued a wired haired terrier mix named Hobo. He is so fun and full of personality! I’ve never had a dog with that in its genetic mix, but always imagine they they must just full of fun and energetic Hobo sounds adorable! These days our home is shared with a 9yo black Lab cross named Brody and a pair of 8yo tortoiseshell cats, Moxie and Coonie. We’ve nearly always had at least one dog and/or cat in our home! Some of my stories have pets, and some don’t! I love labs. Our “grandpuppy” Abby is a lab and now white muzzled, but she is just the sweetest old gal. Love the names of your pets! We have 2 cats, both Russian Blues, but very different personalities. “Blue” (she was named before we got her) is now 16 years old, but quite active still. Bessie is “only” 12, and is FAT. We call her our beached whale :-) They don’t like each other :-( Bessie cuddles during the day and Blue at night. TWO people responding today, who have Russian Blue cats! I need to google them to see what they look like! Just from the name, they sound beautiful. I was glad to see your border collie; we have a bc/german shep mix. He is about one year old and very hyper. He is intelligent, obeys some commands, but I think we’re a little old to manage him..lol. But we are hanging in. It has been 10 yrs. since we had a pet! Our border collie came from a shelter, and was skeletal-thin when we got him. We figure he was probably The Famous Returnable Dog, because he must have been un-adopted so many times. He was about a year old, an incessant barker (and I do mean incessant–he would bark for hours and barely take time for a breath. ) It also took almost three years to get him house-broken. We finally kenneled him at night, and he would roll in his messes–from ears to tail, he would be a stinky mess by morning. But, he evolved into the sweetest dog ever. He “talks” to us in yodels and sing-song “words”…never had such a vocal dog! We have one very spoiled cat at our house. We have talked about getting a dog, but my cat is 12+ years old and she’s always been very skittish. Just not sure how she would handle another animal being in the house. Sadly, we don’t have any pets. Our dog was 18 and we had to put her down in April, her quality of life was just going downhill so fast. We had adopted a younger cat (maybe a year or so) from the shelter, and had her for only about 5 years when she got really sick and took her to the vet. She was losing weight and her stomach was getting really big. We knew she wasn’t pregnant because she was spayed and never went outdoors. It was discovered she had cancer & we had no choice but to put her down…that was just before Thanksgiving in 2015. The cat we had before her, we had gotten when she was 6 weeks old and had her for 12 years when she passed away. We’ve had other dogs and cats over the years too. I think we’ve decided for now to go pet free because it’s just too hard to let them go when it’s time, it just hurts too much.